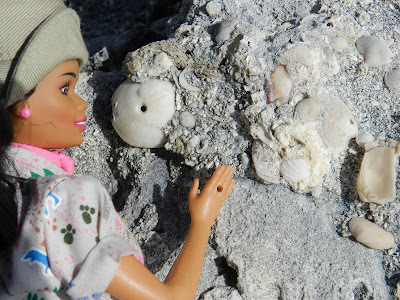 Right after Christmas 2011, Paleontologist Barbie collected her snorkel, mask, fins, sun screen, and superlative knowledge about how to teach the concepts of uniformitarianism out in the field, and headed to the farthest island on the Bahamian platform—San Salvador. 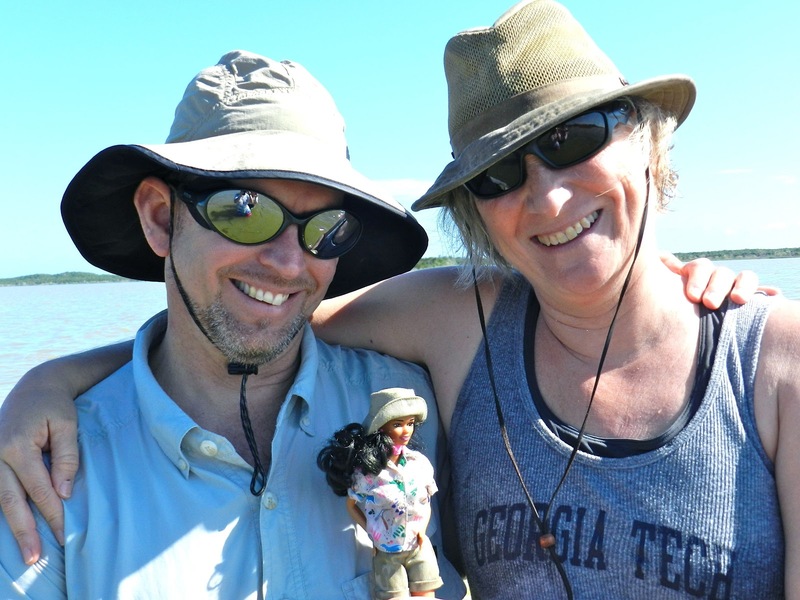 Working alongside my Chiboogabmoo (aka, Tony Martin) and Stephen Henderson, her esteemed paleontologist colleagues, Paleontologist Barbie herded 12 Emory students to their spartan accommodations—the Gerace Field Station (GRC). Adapted from a US Naval base more than 30 years ago, the GRC is the perfect place for recovering from a hot day out in the field. The Bahamian staff prepare excellent meals three times a day and keep the compound equipped with a library, classrooms, labs, auditorium, and rooms are pristinely clean. Perfect for 11 days and 10 nights of science education exploring modern and ancient environments! Paleontologist Barbie agreed to be interviewed here in Atlanta, Georgia, USA, as winter turned into spring and she got a moment free from her paleontological explorations along the Georgia coast. HALLEUJAH TRUTH: Why is San Salvador, Bahamas, an excellent destination to teach uniformitarianism using modern and ancient environments? 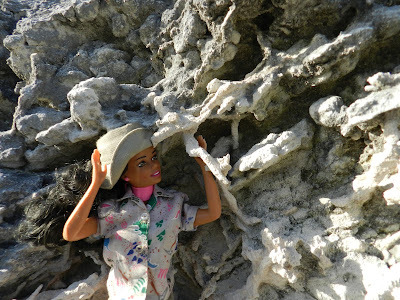 PALEONTOLOGIST BARBIE: San Salvador has sediments and rocks that are both made of calcium carbonate. And the calcium carbonate can cement really quickly. This means the sand they see today can become rock tomorrow. So the students get to find out how modern environments can become part of the rock record almost overnight, geologically speaking. HALLEUJAH TRUTH: Why is a field course like this so important for students to experience? 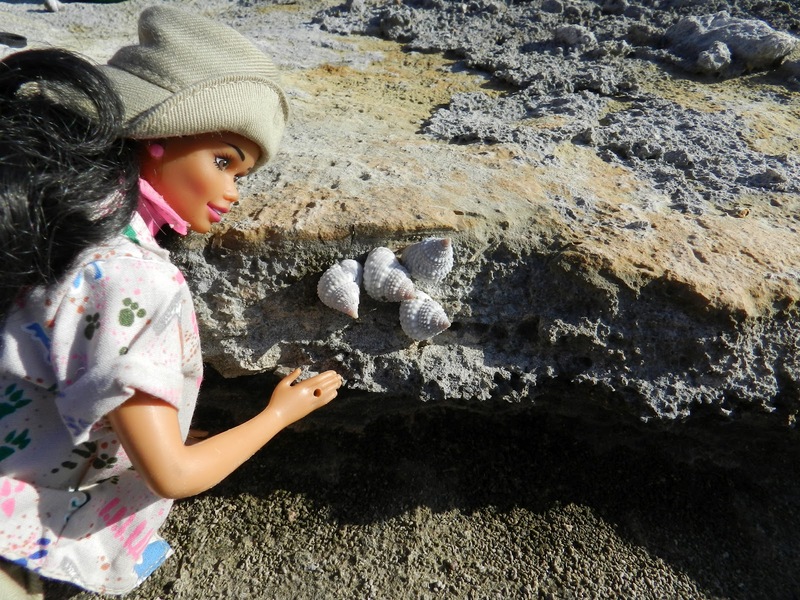 PALEONTOLOGIST BARBIE: For one thing, it gets them outside. Much of their learning is in the confines of a college classroom. That's okay, but if they really want to learn paleontology and geology, we have to get them in the field. And in this class we're in the field every day. 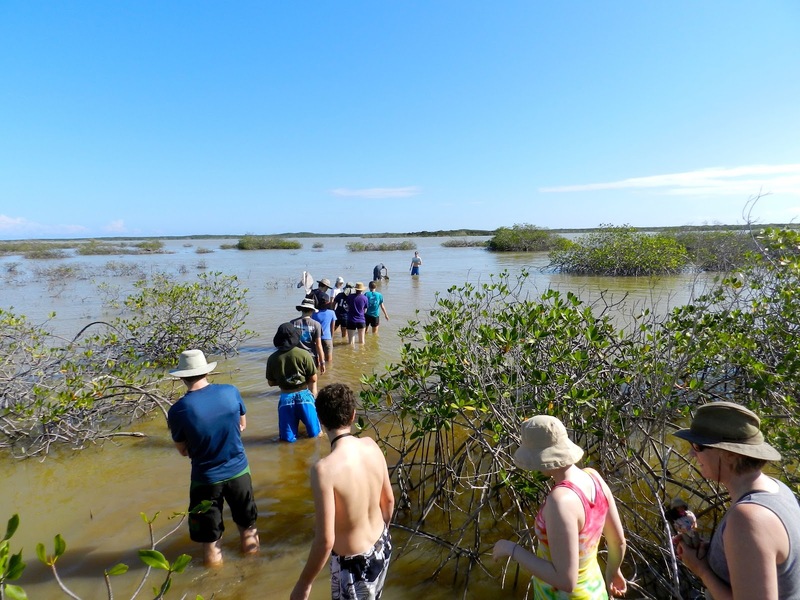 HALLEUJAH TRUTH: What was the first thing you and your colleagues Chiboogamoo and Stephen Henderson did with the students after getting to the field station? 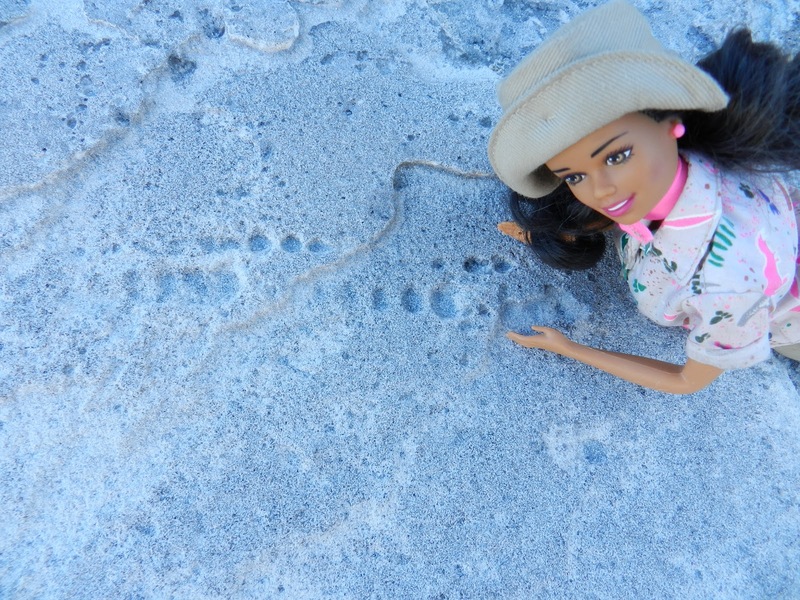 PALEONTOLOGIST BARBIE: We took a walk into the Precambrian. There is a lake on San Salvador, Storr’s Lake, that has such high salinity that nothing can live in it except bacteria, algae, and a few small snails and fish. HALLEUJAH TRUTH: What is the lesson they learn there? 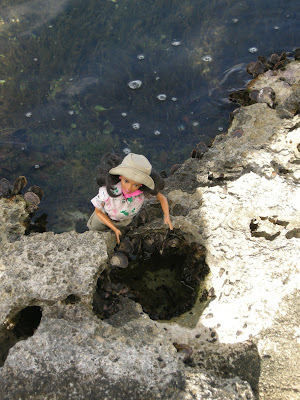 PALEONTOLOGIST BARBIE: Storr’s Lake has stromatolites, and it is one of the few places in the world that has those. These are hard-layered colonies of bacteria and algae that form dome-like structures. What’s really cool about these structures in Storr’s Lake is that they are very much like stromatolites from the fossil record going back more than 3 billion years ago. HALLEUJAH TRUTH: Why do you have students walk into Storr’s Lake? 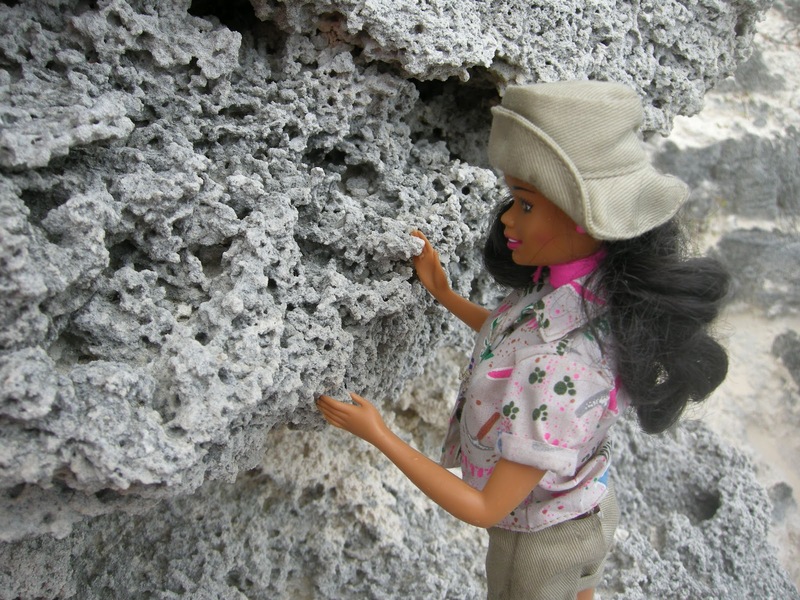 PALEONTOLOGIST BARBIE: We want them to experience what it is like to be in the Precambrian before animals were ruling the earth. Instead, bacteria and algae are ruling Storr’s Lake. Isn’t that neat? HALLEUJAH TRUTH: Can you tell us more about stromatolites? 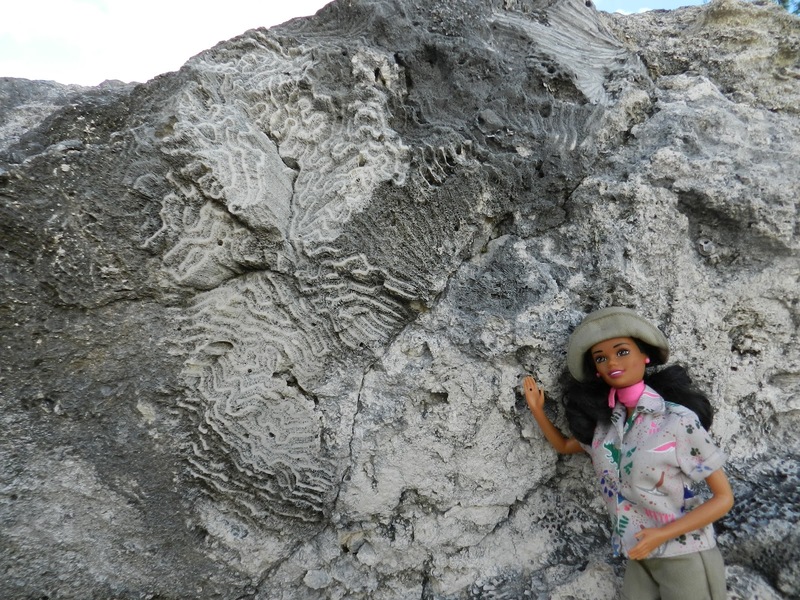 PALEONTOLOGIST BARBIE: Sure, I love stromatolites! Sometimes they look like cabbages. Some times they look like cauliflowers or maybe a weird onion. They have layers on top of layers where the ones on the bottom are the oldest and are the remnants of bacterial and algal colonies. The layers on the top are living colonies, so this shows how they grow upwards towards the light because these bacteria and algae are photosynthetic. That is one of my favorite words—photosynthetic! 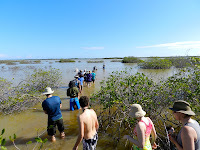 HALLEUJAH TRUTH: At Pigeon Creek, where you give students the opportunity to snorkel, you also give a lesson about harvesting conchs. 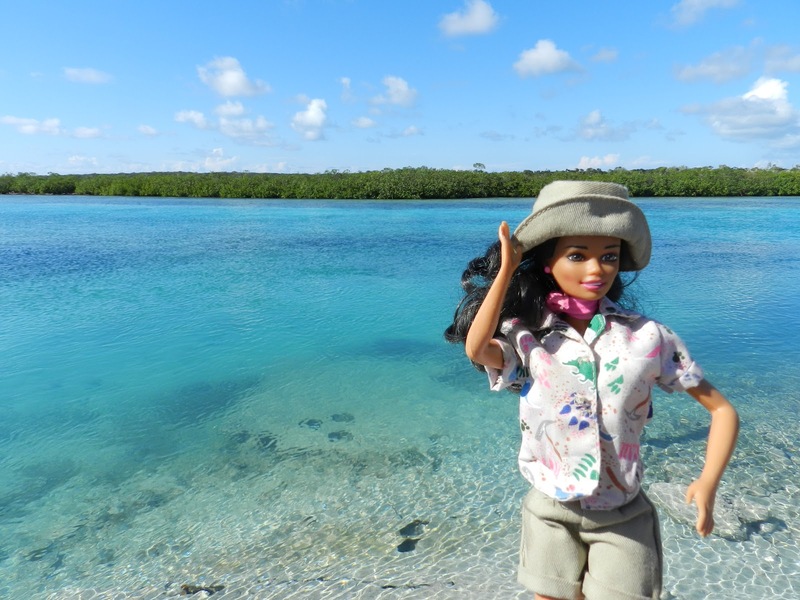 PALEONTOLOGIST BARBIE: Pigeon Creek is a beautiful lagoon that empties into the Atlantic Ocean from a tidal creek. I always love going there, but I'm also made sad by the piles of dead conch shells on the shore. All of these conchs were killed by people for food. But people have taken so many of them that there aren’t very many left anymore. I tell students that conchs shouldn’t be harvested if they don’t have a lip, which means they’ve reached the maturity to reproduce. HALLEUJAH TRUTH: What else do you have students look for in Pigeon Creek? HALLEUJAH TRUTH: I can see that this particular aspect of teaching in the field delights you. You can talk about this excitement? PALEONTOLOGIST BARBIE: We get to use our minds and our bodies at the same time. If you are snorkeling over a reef, you are physically engaged but at the same time you are identifying the corals, examining the fish and their behavior, and figuring out how those whole ecosystems are working. I can’t think of anything more fun to do in the field--having fun while having deep thoughts. HALLEUJAH TRUTH: Do you give students maps of San Salvador? What do you want them to learn about navigation? PALEONTOLOGIST BARBIE: Yes, we do give them a map of San Salvador. Maps are really cool tools! We want them to learn how to use them. Every day we like to ask the students to point to north. The first day they're pretty bad at it. By the second or third day, they are starting to understand how the position of the Earth’s Sun—and I like to call it the Earth’s Sun because of my interest in astronomy—tells them which way is east, south, west, and north. HALLEUJAH TRUTH: Yes, “a sense of place”—I like that idea! And it is also good to see how this “one place” or an island like San Salvador can be so different from one end to the other. Can you say something about these differences? 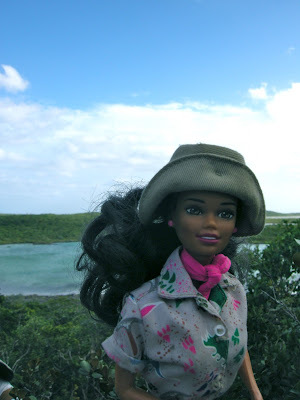 PALEONTOLOGIST BARBIE: Excellent question! The southwestern end of the island is called Sandy Point, which is because it has the most sand-duh! But that is totally different from the northeastern end of the island that has a rocky coastline made from rocks formed about 5,000 years ago. HALLEUJAH TRUTH: You use the terms, bioerosion, limestone, Pleistocene Epoch, trace fossils, can you give me a quick lesson here? 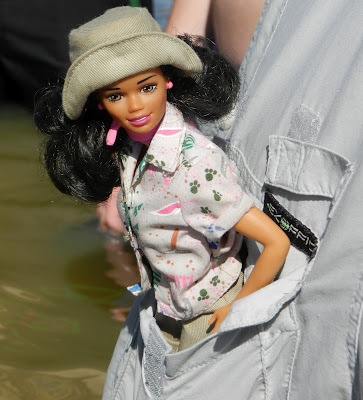 PALEONTOLOGIST BARBIE: Sure. Bioerosion just means the process where animals and plants wear down rock. So some snails, for instance, are chowing down on algae that might be on coastal rocks. While they are scraping that algae, they are also breaking down the limestone. Parrotfish--those are my favorite bioeroders--they crunch on coral to get the algae. And I am embarrassed to say it, but what comes out the other end of the parrotfish is the sand that you end up lying on along the beach! Ewww!! 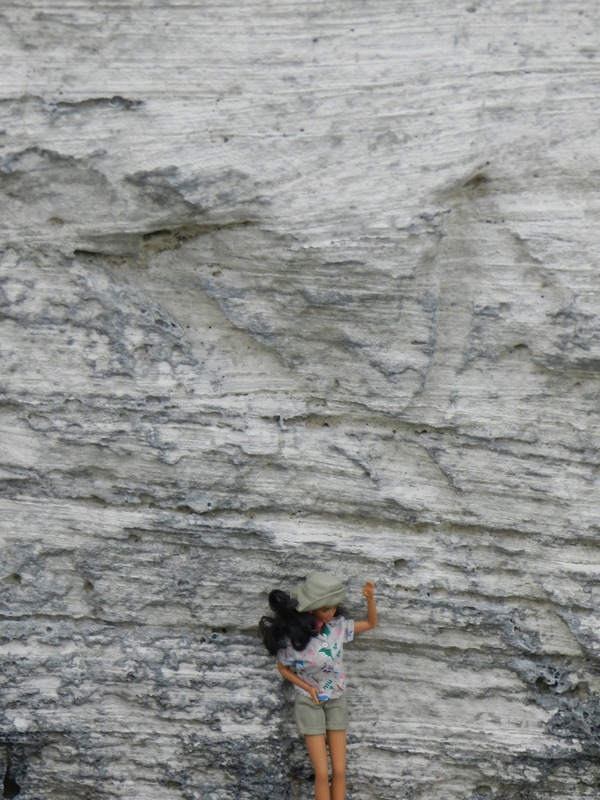 (Paleontologist Barbie smiles devishly.) 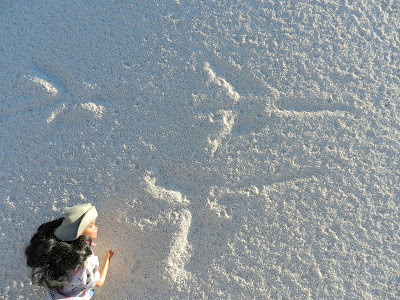 That’s right, most of that beautiful white sand on a beach in the Bahamas is parrotfish poop! I guess I could write a dissertation on each of those topics, bioerosion, limestone, Pleistocene, and trace fossils. So I'll just summarize here: There are Pleistocene and Holocene rocks that have trace fossils on San Salvador. These trace fossils tell you what environments made the limestones. 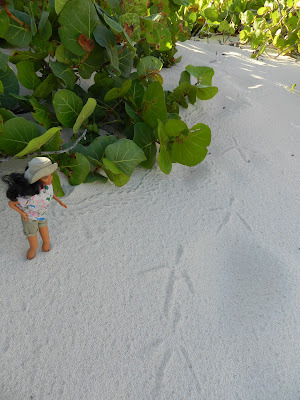 HALLEUJAH TRUTH: About trace fossils….How can a root make a trace? It doesn’t have behavior does it? I’m evoking my understanding of your and Chiboogamoo’s concept of The Holy Trinity of Ichnology: substrate, anatomy, and behavior. HALLEUJAH TRUTH: What do you want students to understand about modern coastal dunes? PALEONTOLOGIST BARBIE: Most of the rocks on San Sal are fossilized dunes from the Pleistocene and Holocene Epochs. These dunes have gorgeous cross-bedding, root trace fossils, insect burrows, and other evidence of environments formed when sea level was low. When students look at modern dunes, we want them to see how those can be related to what they are seeing in the geologic record. Most of the same things are there, and all they have to do is look carefully to see them. HALLEUJAH TRUTH: So San Salvador really provides an excellent outdoor classroom to teach the concept of uniformitarianism! I know that you were excited about showing the students the holotype of a ghost crab burrow after they saw numerous modern ghost crab burrows on Sapelo Island, Georgia, USA. Could you explain what a holotype is and why this one made by a ghost crab is so thrilling? 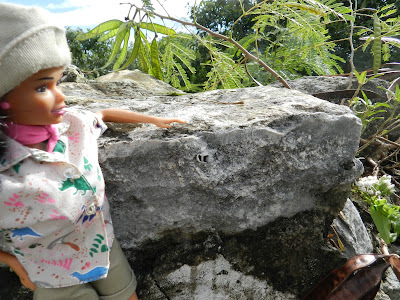 PALEONTOLOGIST BARBIE: Wow! That was the most exciting part of the trip, to see the holotypes for two trace fossils in the field! The ghost crab burrow, Psilonichnus, was only one of them. A holotype is a specimen that paleontologists use to compare to all other fossils that might be like it. Usually, holotypes are in museums. The holotype of Psilonichnus is in a limestone outcrop and could not be collected, so there it is almost 30 years after it was first named as a holotype still there in the outcrop! I feel like I am a part paleontological history every time I go to San Salvador and visit Psilonichnus! I absolutely adore ghost crabs. They are such complicated animals. Did you know that they have little gills and little lungs? That means they can live part of the time on the land, but they have to go to the water to wet their gills. They are perfect examples of what evolutionary biologists call transitional animals! And you know I love evolution! HALLEUJAH TRUTH: Wasn’t it physically challenging for the students to get to the site of this Psilonichnus? Rocks that cut if you fall and an encroaching tide? PALEONTOLOGIST BARBIE: Oh yeah! That was part of the adventure. And I’m all about adventure--leading by example is the best way for students to figure out how they are going to get through tough conditions in the field. Sometimes I have been nicknamed "the honey badger of paleontologists." I don’t deny it. I want the students to be inspired–plow through those environments with me. HALLELUJAH TRUTH: You mentioned another holotype located on San Salvador? 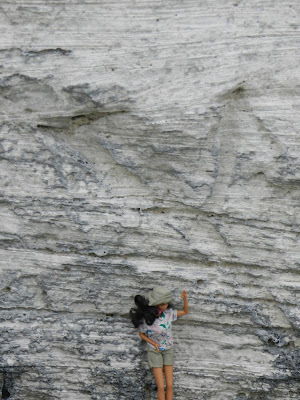 PALEONTOLOGIST BARBIE: Oh, thanks for reminding me. It’s the only fossil hermit crab trackway known in the world, Coenobichnus. 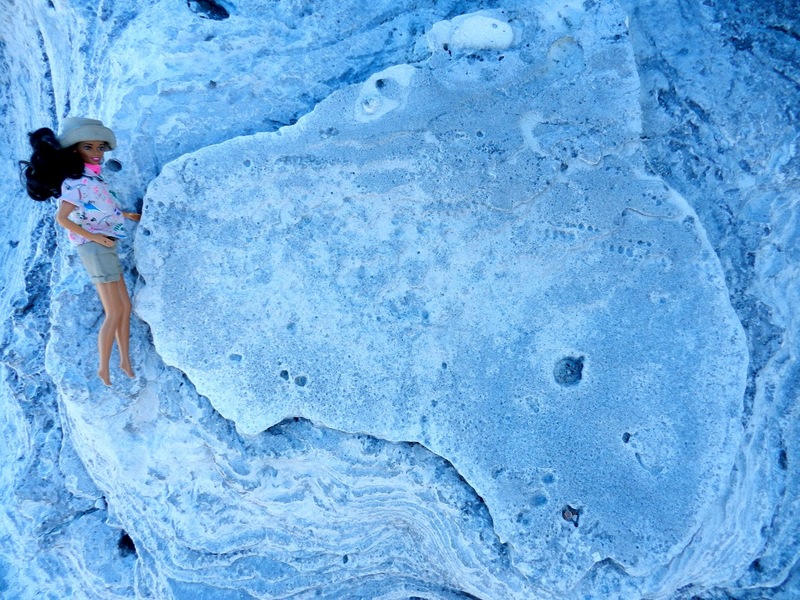 One of my heroes in paleontology, Dr. Sally Walker, described and named this trace fossil holotype, which is on North Point on San Salvador not far from the field station. 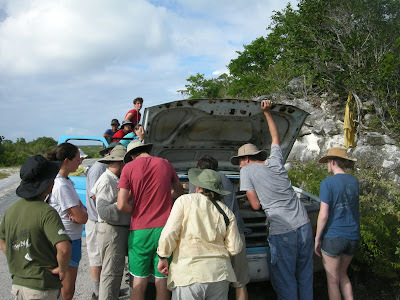 HALLEUJAH TRUTH: I know one of the most exciting sites for students is seeing the fossil coral reef on San Salvador! I would love for you to explain their “wow”! PALEONTOLOGIST BARBIE: Wow is the right reaction! 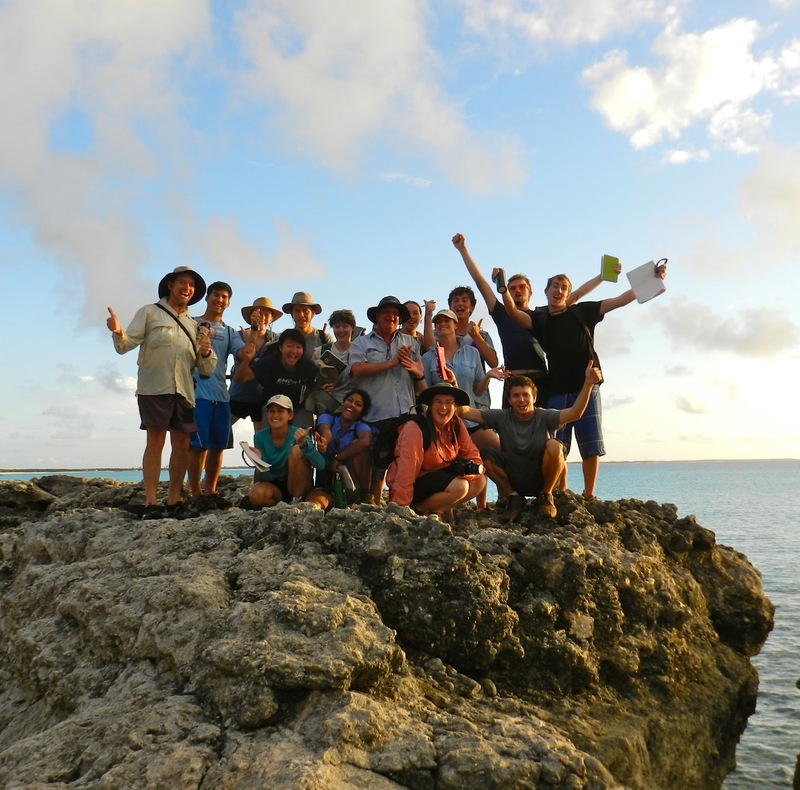 By the time we go to the fossil coral reef, the students have already snorkeled several times along modern fossil reefs. This fossil coral reef is from about 130,000 years ago and because it is now on land, it shows the students that sea level was much higher way back then. What’s also amazing for the students to see is how the same species of corals they can see in a modern reef are preserved as fossils in this reef. They can make the comparison between the modern and fossil reefs with almost no effort at all—that is, can you spell it?—U, N, I, F, O, R, M, I, T, A, R, I, A, N, I, S, M! HALLEUJAH TRUTH: Do you have a favorite fossil coral? PALEONTOLOGIST BARBIE: Great question! If I had to narrow down my favorite fossil coral to one, I’d have to say those huge fossil brain corals of the genus Diploria. They make fantastic complicated patterns that just bring out the artist in me! HALLEUJAH TRUTH: You were on San Salvador for 11 days and 10 nights, what was the most exciting geological phenomenon for you? PALEONTOLOGIST BARBIE: Two things--one which is occurring very slowly and the other which is happening dramatically. The slow one is bioerosion. When you see millions of snails and chitons scraping the coastal rocks, you see how rocks can get worn down day by day over time. The dramatic one is waves. These waves are smashing persistently against the same rocks being worn down by bioeroders. The rocks don’t stand a chance against these two things! HALLEUJAH TRUTH: While you are witnessing all these dramatic and fantastical aspects of geology on San Salvador, you must need sustenance, what can you say about the Gerace Research Center's food? 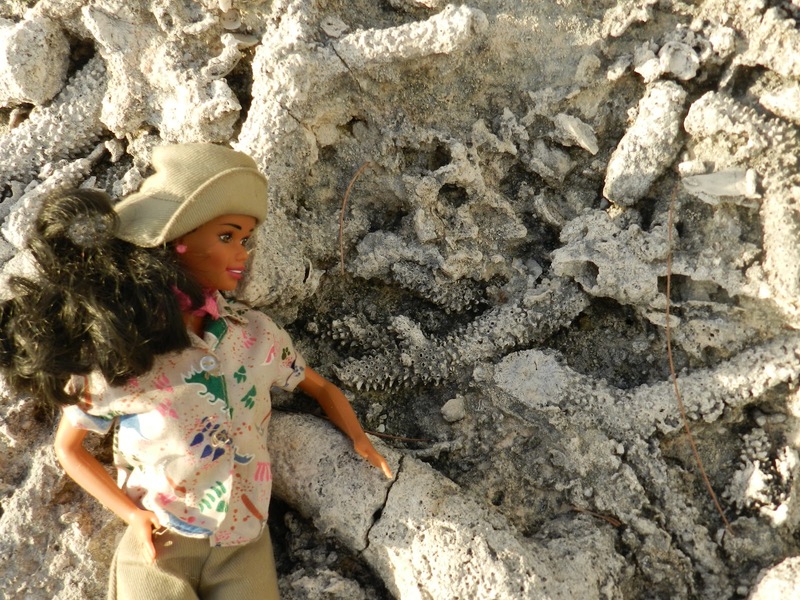 PALEONTOLOGIST BARBIE: I love it! Every morning, we had a hardy breakfast of pancakes, French toast, or scrambled eggs. For lunch, we either had sandwiches with homemade bread in the field or a hot three-course meal at the field station. Then dinner was always delicious in its abundance of meat and vegetarian dishes. Meals were very satisfying. 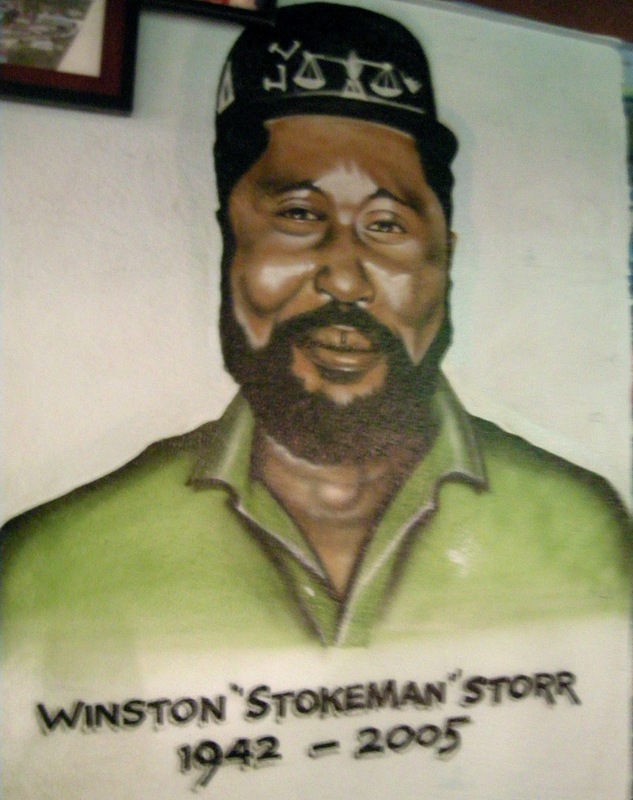 The Bahamian field station cooks really know what they are doing. I felt like applauding them every night, and I did! 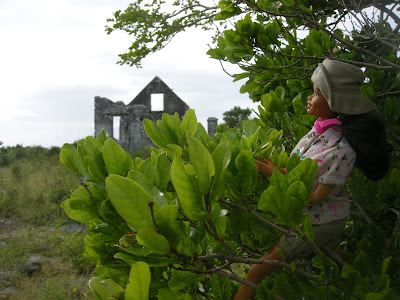 HALLEUJAH TRUTH: Now Paleontologist Barbie, I know that you are first and foremost interested in non-human research, but you did take the students to some archaeological sites. Why? 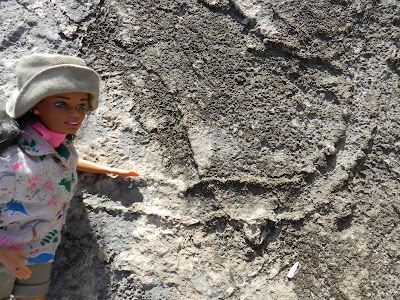 PALEONTOLOGIST BARBIE: San Salvador has a unique place in human history. This is where Christopher Columbus probably landed. I don’t have to give you any more details to let you know how important this island is to the rest of the world. 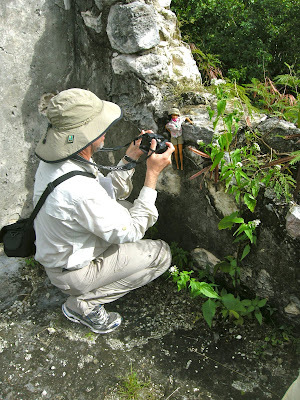 HALLEUJAH TRUTH: One of the geologists, Larry Davis, who has been researching fresh water on San Salvador for close to 30 years, has a saying, “Only the superior go into the interior.” What does this mean and why do you and my Chiboogamoo take your students to the interior of San Salvador away from the beautiful turquoise water and white sandy beaches? PALEONTOLOGIST BARBIE: Hey! If you are going to be a REAL PALEONTOLOGIST or a REAL GEOLOGIST, you have to go into tough places. 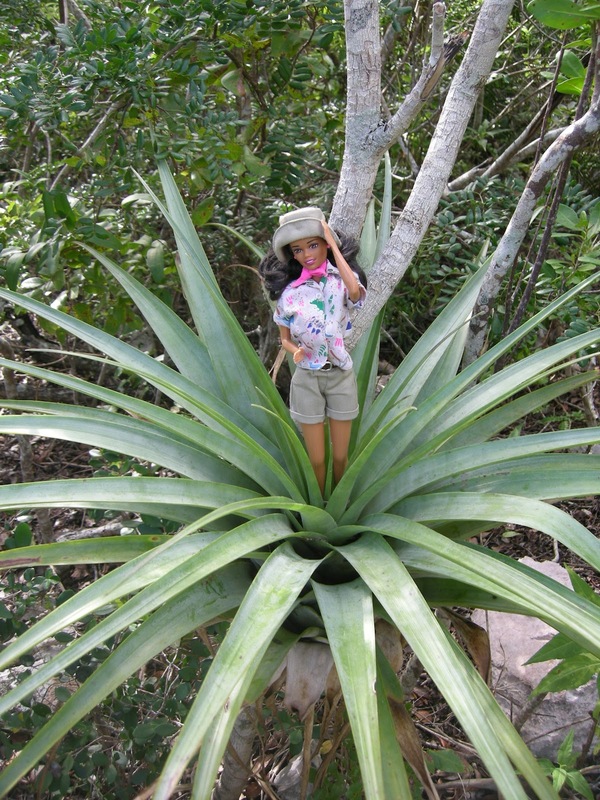 The interior of San Salvador has pointy and poisonous plants, sharp limestone underfoot, lots of parasitic insects, and can be just plain miserable. I LOVE it! 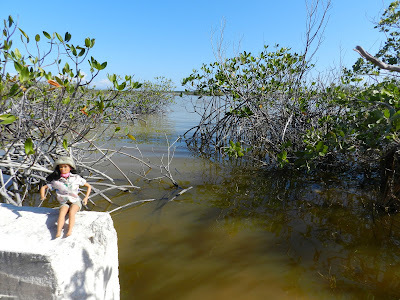 We go there to see some of the Pleistocene rocks that have fossils showing how that part of the island was once a lagoon, just like the modern one we saw in Pigeon Creek! So if we didn’t go to the interior, the students would never make that connection. Repeat after me: U, N, I, F, O, R, M, I, T, A, R, I, A, N, I, S, M! HALLEUJAH TRUTH: Did you and the students have any leisure time during the 11 days you were on San Salvador? 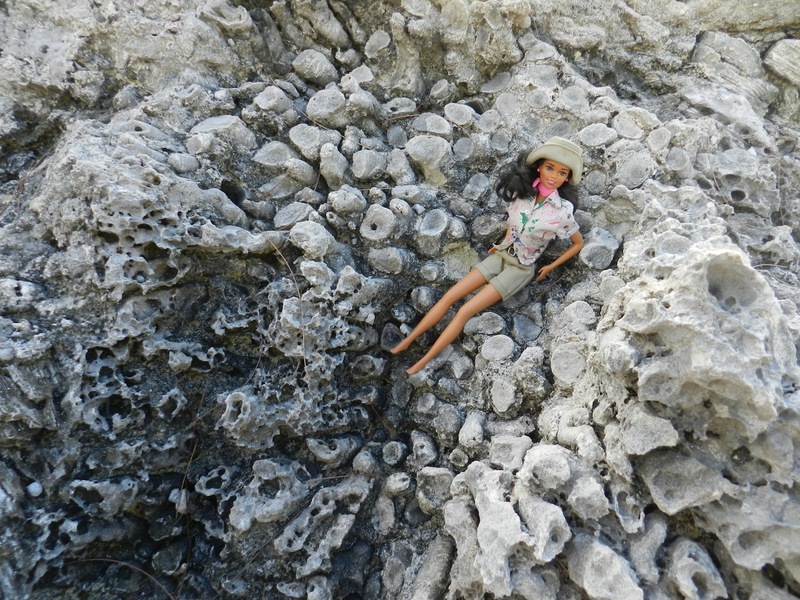 PALEONTOLOGIST BARBIE: Well, not much during the day. There was no time to lie on the beach and get a tan. But at night, sometimes we walked the mile-and-a-half to the nearest bar, called The Short Stop. This is a long time tradition for geologists, paleontologists, and biologists to go to the Short Stop and talk about what we learned during our time in the field while quenching our thirst. We also spent New Year’s Eve there, so the students got to experience a little bit of Junkanoo, which is the Bahamian New Year’s festivities. HALLEUJAH TRUTH: Yes Paleontologist Barbie, I know you enjoyed your Kalik and the ART on the walls of the Shortstop. I always like to discuss ART with you since you see a natural connection between science and art. What did you think of the sculptures made by San Salvador’s master woodcarver, Kenny Whitfield? PALEONTOLOGIST BARBIE: I thought his carvings were brilliant! It was amazing to watch him work so quickly but so precisely. 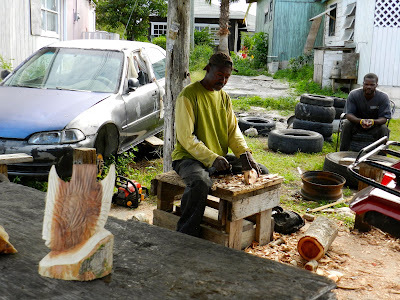 He would take a hunk of wood and instantly transform it into a sea turtle, a sea star, or a grouper! HALLEUJAH TRUTH: Let’s wrap this interview up! 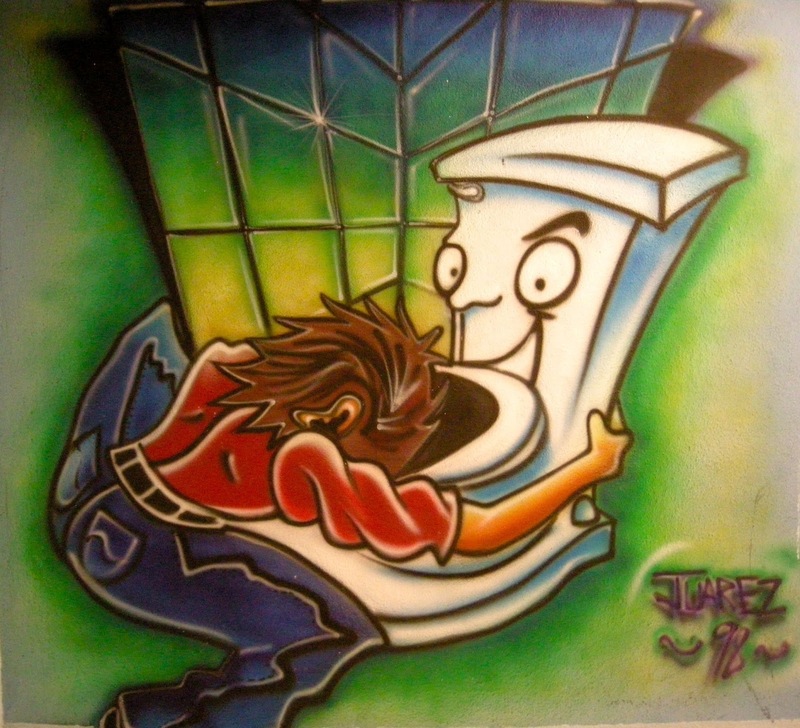 You have been to San Salvador many times, but I know you always look with fresh new eyes. What did you discover on this visit that you hadn’t seen before? PALEONTOLOGIST BARBIE: You’re right! I always try to really look for something new because I know nature is always changing. This time I was especially attentive when we went to Sandy Point. I had a blast looking at all the tracks there! 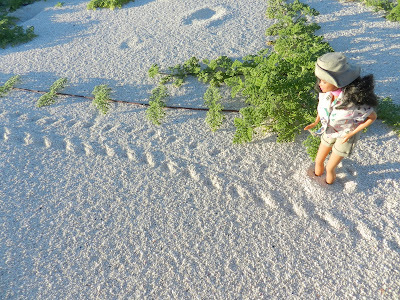 I also imagined how those tracks might get preserved in the fossil record! Who knows? 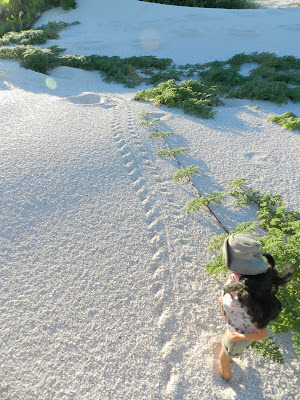 Some day, tracks just like those of the hermit crabs and herons might be found in the rocks of San Salvador. Paleontologist Barbie Pursues Professional Development at 2011 Society of Vertebrate Paleontologist (SVP) Meeting in Las Vegas, Utah, USA. Paleontologist Barbie sees exciting tracks and a really cool dinosaur sitting trace in addition to exchanging knowledge with fellow colleague paleontologists. "Professional development is more important than Halloween parties," Paleontologist Barbie was heard saying out in the Utah desert. Paleontologist Barbie goes to St. Catherines Island to examine reptile burrows. Paleontologist Barbie explains her understanding of evolution by looking at the "Selections" art exhibit at Fernbank Museum of Natural History in Atlanta, Georgia. Specifically, she provides her interpretation of the importance of art done by Chiboogamoo and Hallelujah Truth. 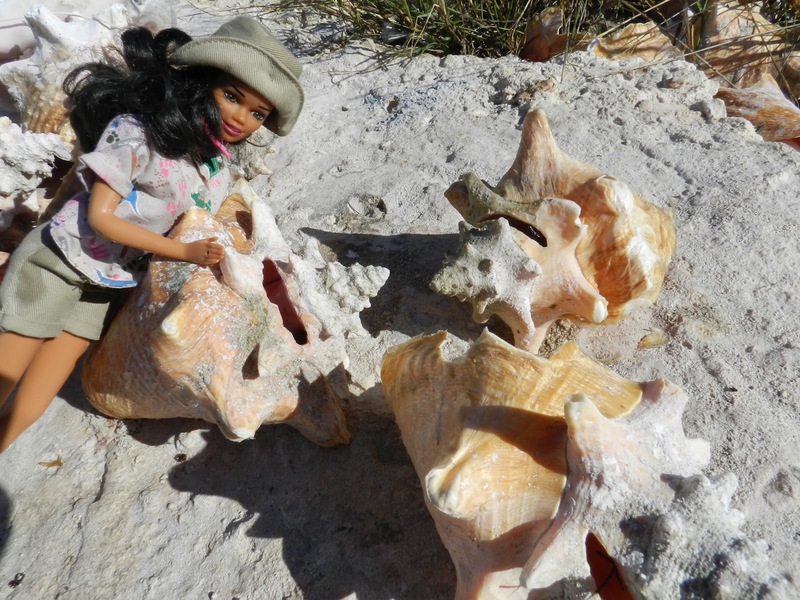 Paleontologist Barbie's Raison D'etre: Scientific Investigation and a Passion for Art! 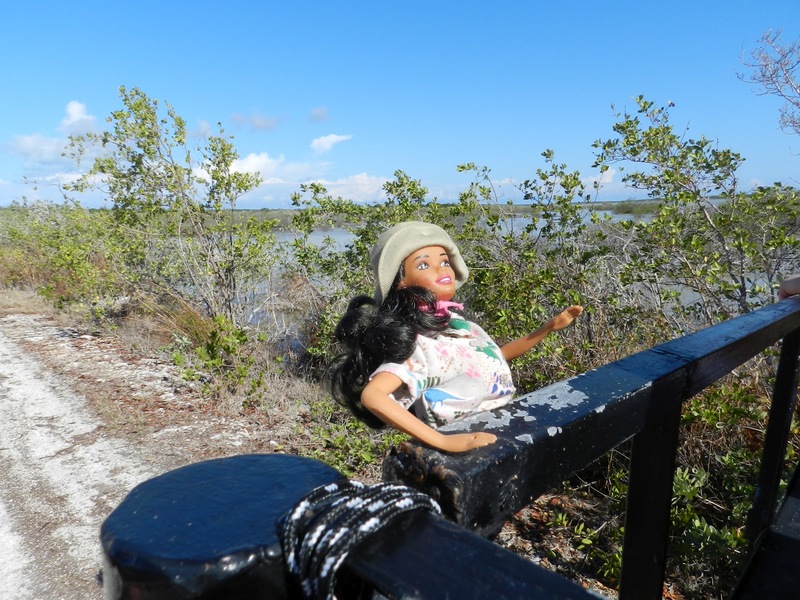 This is the first interview with Paleontologist Barbie! It is a must read! ACKNOWLEDGEMENTS. Big thanks to the Gerace Research Centre, San Salvador, Bahamas, to Dr. Thomas A. Rothfus for his assistance and maintaining a well run and clean field station, and to his Bahamian staff that provide hot meals with smiles and rooms free of sandy floors. It was a pleasure sharing many a meal with Dr. Kari Benson, from Lynchburg College, and her three sons and husband. She gave great lectures on fish of the coral reef! 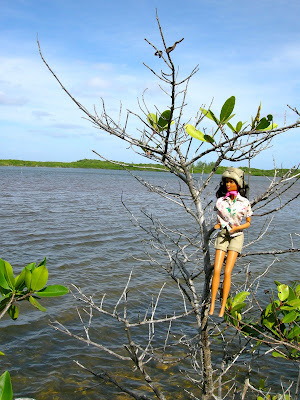 I especially want to thank Chiboogamoo's group of students who embraced Paleontologist Barbie into their fold. 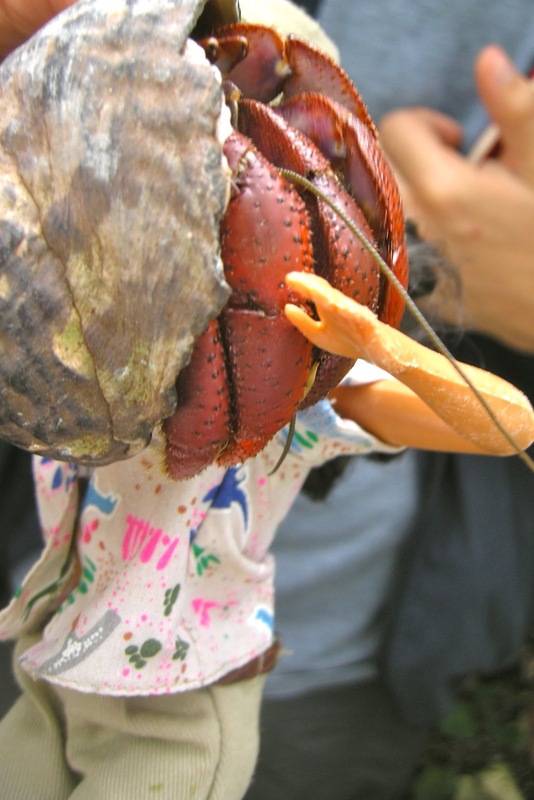 Is it true Paleontologist Barbie met the ghost of Charles Darwin at the British Museum of Natural History at midnight and offered him... certain considerations... and that's why she doesn't have to worry about the parasites or the poisonous insect bites so much? Because that smooth skin cannot be all natural. 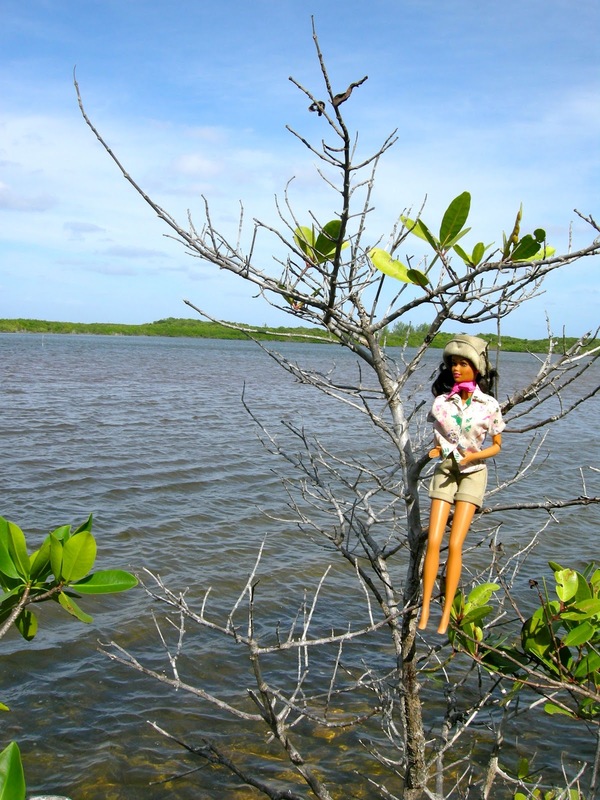 Dear Laura, Paleontologist Barbie's considerable spirit and knowledge wowed Darwin at that moment at midnight. Nothing else occurred, except that Barbie had a great discussion with Darwin about orchids and worms! It amazes me that the moment in time when the heron landed and dragged the sand has been preserved in stone!